Why should you buy SEASOFT's Lemon GrenAIDE™ Enzymatic Cleanser? Because you know what you sometimes do in your wetsuit! ... and sometimes the odor can be strong enough to knock a bird out of the air. This is where cleaners with enzymes and special detergents and top-secret ingredients come into our lives and save us! 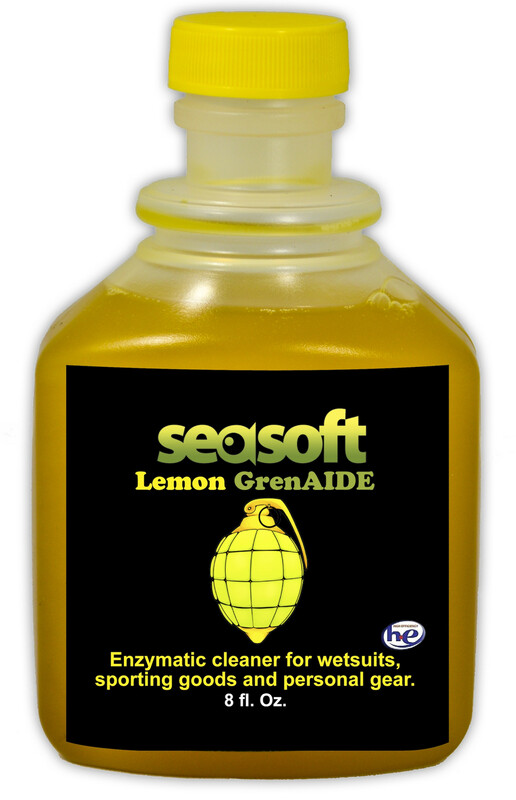 SEASOFT’s Lemon GrenAIDE™ is the newest and most amazing entry into this fight to save our noses and our sanity! It is an enzymatic cleaner that not only kills the most foul odors, it cleans; and then when it’s finished it leaves behind a pleasing real lemon fragrance. Lemon GrenAIDE™ Enzymatic Cleaner leaves that luscious fragrance behind because the “secret formula” is 15% REAL lemon juice! Lemon juice is a natural disinfectant and antibacterial. SEASOFT uses powerful enzymes that destroy the kind of bacteria found in wetsuits, drysuits, gear bags that have been forgotten over the weekend, camping gear, pet beds, booties that could walk by themselves, horse blankets and other stinky things, yet was gentle enough to protect the fabrics themselves. Lemon GrenAIDE™ is engineered to be used in "h-e" front load as well as normal washing machines on the gentle cycle. You simply use .5 bottle of Lemon GrenAIDE™ instead of your normal detergent. For a yummy lemony fragrance, limit the rinse cycle. IMPORTANT: NEVER put a wetsuit or drysuit in the dryer, always hang to dry. Always follow manufacturer’s recommendations on other products. You can also manually soak an item that needs to be treated in Lemon GrenAIDE™, use .5 of the bottle to 10 gallons of water and soak for at least 15 minutes to allow the enzymes to work. You can choose whether to rinse or not. For a fresh lemon fragrance, do not rinse. Lemon GrenAIDE™ conquers the stink associated with all the abuse we heap on scuba wear and sporting equipment. If it can’t be new any longer it might as well be clean and smell amazing! OK, you know what people do in their wetsuits! You know what you do in YOUR wetsuit and sometimes the odor can be strong enough to knock birds out of the air. Lemon GrenAIDE™ Enzymatic Cleaner can leave that luscious fragrance behind because our “secret formula” is 15% REAL lemon juice! Lemon juice is a natural disinfectant and antibacterial. While developing Lemon GrenAIDE™ we used powerful enzymes that destroy the kind of bacteria found in wetsuits, drysuits, gear bags that have been forgotten over the weekend, camping gear, pet beds, booties that could walk by themselves, horse blankets and other stinky things, yet were gentle enough to protect the fabrics themselves. We also know that convenience is important and so Lemon GrenAIDE™ is engineered to be used in "h-e" front load as well as normal washing machines on the gentle cycle or you can follow the manufacturer’s recommendation. You simply use Lemon GrenAIDE™ instead of your normal detergent. For a richer, lemony fragrance, limit the rinse cycle. When in doubt, you can soak an item that needs to be treated in Lemon GrenAIDE™, use 1/3 of the 8 oz. bottle to 10 gallons of water and soak for at least 15 minutes to allow the enzymes to work. You can choose whether to rinse or not. For a stronger fragrance, do not rinse. Lemon GrenAIDE™ will win you over with its ability to conquer the stink associated with all the abuse we heap on scuba wear and sporting equipment. If it can’t be new any longer it might as well be clean and smell amazing!